We have our special 216 needles machines capable to produce styles with little embroidered or micro-fancies designs. These machines are produced in Italy by a small family Company called Busi. They are focused on high quality machines only. 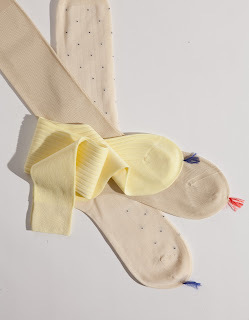 The base of the sock can be made up using cotton, wool, cashmere/silk, linen or silk, but the embroidery has to be made in nylon, because it is the only material can “link and hold” the design on the background, as the nylon is making a kind of “flake” inside the socks, holding the thread to the base. Otherwise we have to use a process called “vanisee” where the machine is working like the jacquard, one colour up and one colour down, but this can be done for bigger designs only. Do you need a Calendar ?